Each and every post you see from your Friends is a gateway to changing your News Feed! It’s easy to cut down on yet more clutter this way. Hover over any post and you’ll see a down arrow/chevron near the top of that post. This reveals, when clicked a myriad of options to control visibility of updates. 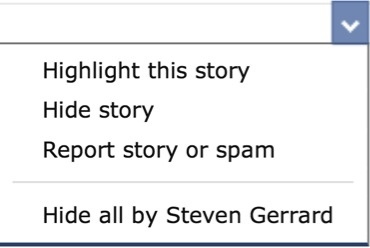 I won’t cover the first three options today. They relate to particular, individual posts. Here you can see a small mini menu of options related to how you see this Friends posts. In this example I have “Peter” in my Close Friends list and so I see almost everything he posts. Thus it isn’t surprising to see All Updates selected. 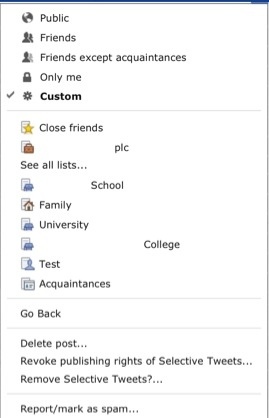 If you wanted to allow Facebook to filter out most of your Friends sets, leaving only potentially important stuff, then you can select Only Important. These are the relationship and life events we have spoken of before. If you feel you are willing to see a bit more from your Friend but not really everything then you can select Most Updates. This should get rid of chatter from games etc. but leave Status Updates and the like still visible. Unsubscribing is essentially removing all posts by your Friend from your News Feed. The second option is variable depending on the type of post you are viewing. In this example “Peter” has posted from Spotify so that is classified as Music and Videos. Now this may be very useful. 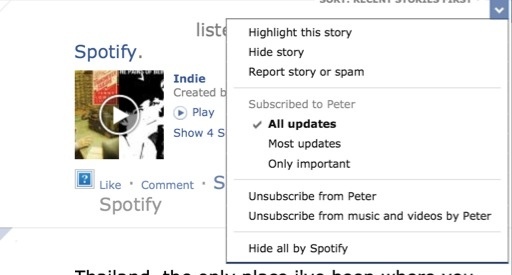 If you have no interest in what is generated by a particular App, like Spotify in the example, then you can use the last option to hide anything that it generates from your News Feed. Importantly, this is Global; you will get no posts from this App from any of your Friends. Here’s a different example, perhaps I want to hide everything from Birthday Number One. On some posts you’ll find your options massively limited. These are normally the posts from Pages or public figures. You get a similar menu for your own posts. We’ll cover these another time though. Be cautious before hiding an App. Some are your Friends‘ primary method of updating Facebook.